I think in every kitchen there should be cookbooks. I have a ton, I collect them. One time, I left a store with five. I love to sit down on Sundays and pick out recipes for the week. Being that I cook so much, I wanted to share my favorite series with you. A couple years ago, my Mom got me the cookbook “Skinny Taste” by Gina Homolka. Needless to say it became a quick favorite. The recipes were easy and low cal. The easy is a big factor now because I’m usually cooking with a baby on my hip. I’m currently writing this with a Theo on my hip, in fact. I’ve shared a lot of recipes from this over the years. A second book was released “Skinny Taste Fast and Slow”. Again, loved it. Recently, and to my emenace happiness a third came out. “Skinny Taste One and Done”. 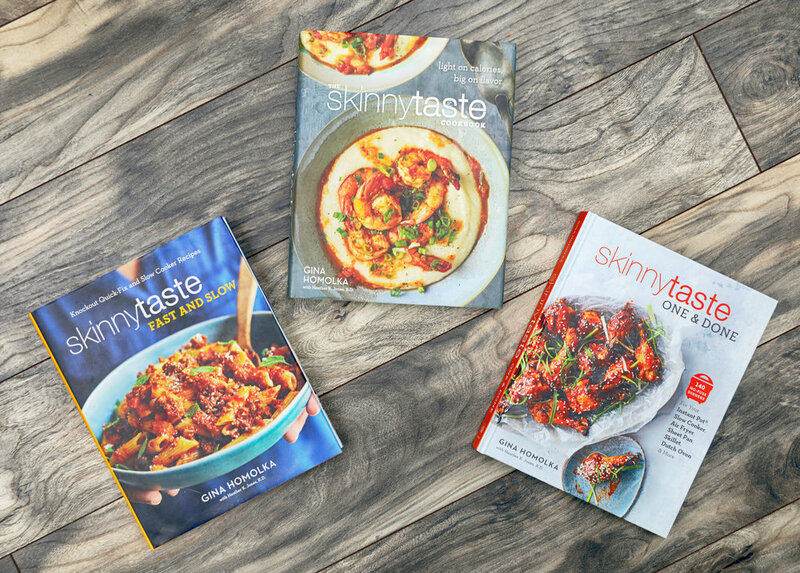 These are the three cookbooks I use most in my kitchen and if you’re in the market for easy, healthy recipes then head to Amazon right now and check them out! One thing you may not know about me is that I have a deep love for soup. And nothing is more cozy then a hot bowl of soup on a cold winter day. So today I am sharing Gina’s Creamy Cheddar-Broccoli Soup. Not only is it easy and delicious, it’s only 210 calories per cup. In a Dutch over or large pot, melt butter over medium-low heat. Add onion, carrot, celery, and garlic and cook, stirring, until softened, 5 to 7 minutes. Add the flour, salt, and pepper to taste and stir until smooth. Add the chick broth and milk, and potatoes. Increase the heat to high and bring to a boil. Reduce the heat to low, cover, and cook until potatoes are soft, 10 to 15 minutes. Stir in the broccoli and Parmesan. Cook, stirring occasionally until broccoli is tender, about 8 minutes. Remove from heat, add cheddar, and stir well until melted. Using an immersion blender, blend the soup for a few seconds, leaving some chunks (or transfer about three cups of the coup to a regular blender, and puree and add it back to the soup. This is what I did.) Ladle one generous cup into each of six bowls and serve hot. This recipe was so easy and so delicious. Perfect for a winter day. Plus, you don’t even have to feel bad about eating it! Do you have a favorite cookbook? Tell me all about it! I’m always looking to add to my collection!